When it comes to American made men's polos, King Louie, is the King! 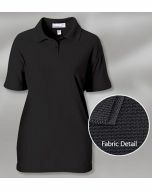 This top-selling polo features a polyester and spandex blend designed for active men. Easily go from the golf course the the boardroom in style and comfort with King Louie America. 96% polyester / 4% Spandex shirt with an waffle pattern.